Calling All Kids Ages 5 – 11 Years Old! 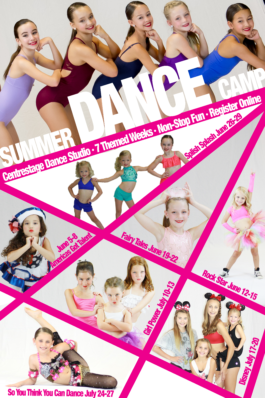 During the months of June & July, Centre Stage Dance Studio will be provides 7 different themed dance camps. These SUMMER DANCE CAMPS are perfect for young dancers that love to have a break from school but still be a part of something fun and exciting. Every week is a different theme. Inside each week dancers will have the opportunity to learn fun dance routines but also participate in themed based crafts, games and special guest. At the end of each week we even invite family and friends to the end of each camp to check out the dances they learned that week! ENROLL ONLINE! At the bottom of this page is a form to fill out. Simply fill the form out, pay online, and your dancer is registered! Please fill out the registration form below and bring to the studio with you or register online at the bottom of this page. By going to more than one FULL WEEK camp you will receive an additional $10 off each camp! For example, if you enroll in Camp 1 (Americas Got Talent!) & Camp 2 (Rockstar!) before May 1 it would cost $159 for the first camp and $149 for the second. Dancers need to be dropped off in our Blue Room at 9:00am. We ask that you do not drop them off any earlier than 8:55am, as our staff is finalizing plans for the day and cannot be responsible for dancers until they start the camp at 9:00am. At the time of drop off, you need to let the instructors know if anyone, other than the dancer’s parents, are picking them up. That way we know who to expect and feel confident in releasing your child to them. Dancers need to be SIGNED out by the person picking them up in the Blue Room at the end of camp each day (3pm). We will not release your dancer to go out to the parking lot to meet you. Dancers should wear comfortable clothing to camp. Spandex shorts and a sports bra or tank is best. As the kids will be tumbling, baggy shorts and/or top is not recommended. Bare-foot is fine for all classes, but kids are welcome to wear foot undeez or jazz shoes if they’d like. Please send your dancer with their hair put in a pony or bun. We do not supply hair bands, and it is a big distraction if your dancer’s hair is down in their face. It’s best if your dancer brings a small bag to put all their belongings in… snacks, lunch, shoes, etc. Please have everything labeled so we can get it back to them if it is lost! We will give a snack break in the morning for those doing the morning or full day camp, and lunch will be taken around 12-1pm for those doing the full day camp. Please send your dancer with snacks and a lunch that does not require a refrigerator or microwave. We’d recommend them to bring their own water bottle (labeled with their name) as well. We will be doing a craft every day. All crafts will be provided by Centre Stage. Every week of camp we will be bringing in a special guest (Magician/Face Painter/Etc). Just something fun for the dancers to get excited for! On the Thursday of camp, we will be doing a performance for parents. We will do a short performance @ 11:45am for the few kids only doing the morning camp. Parents of kids doing full day or afternoon camp are invited to come at 2:30pm on the Thursday of camp to see the dancers perform the dances they have learned. Please arrive early as parking is tight. (DO NOT PARK IN THE SPOTS DESIGNATED FOR FITNESS OR THE PARKING LOT NEXT DOOR… THEY WILL TOW. PARKING IS AVAILABLE ON THE STREET IF NEEDED)..